All of the unit height and pin count combinations of the straight One27 connectors can be delivered to your doorstep within two to four weeks! 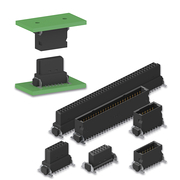 Parallel PCB connections with distances ranging from 8 mm to 13.8 mm can be implemented with the One27® connectors thanks to their absolutely secure mating. To this end, the straight connectors (male and female) are available as either mid-profile or low-profile types. All connectors from the One27® range are available with pin counts of 12, 16, 20, 26, 32, 40, 50, 68, and 80. Thanks to a coplanarity tolerance of just 0.1 mm, the One27 connectors can be soldered to the PCB easily and securely. Board locks, i.e., lateral metal brackets, that are also soldered onto the PCB ensure that the connectors can withstand heavy load capacity between the connector and the PCB. The PCB connectors are shipped in tape-and-reel packaging to facilitate automatic SMT assembly. It is easy and reliable to connect the One27® SMT connectors thanks to their large capture range: The permissible center offset is 0.7 mm along both the longitudinal and the transversal axis. The tolerance for angular inclination is 4° longitudinally and 2° transversally, which means the connection between the male and female connectors is particularly reliable. This is ensured by the double-sided female contacts on the female connector, which envelops the contact pins of the male connector from two sides, ensuring a safe connection in any application. Moreover, the connector is plugged on the smooth, rolled surface of the female contact. Excessive wear and tear of the contact surfaces and shavings become a thing of the past when using the One27® connectors for plugging applications.